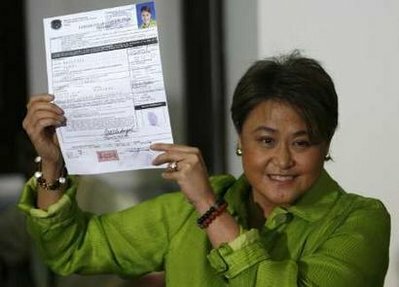 Initially, there were 99 aspirants who filed their certificates of candidacy for the position of President of the Philippines. However, after much deliberation, the COMELEC has only allowed 8 candidates to run for President. Sen. Benigno “Noynoy” Aquino III (Liberal Party), Olongapo City councilor JC de los Reyes (Ang Kapatiran), former President Joseph Estrada (UNO-PMP), Sen. Richard Gordon (Bagumbayan), Sen. Jamby Madrigal (independent), former Defense Secretary Gilbert Teodoro (Lakas-Kampi-CMD), Bro. Eddie Villanueva (Bangon Pilipinas) and Sen. Manny Villar (Nacionalista Party). Sen. Mar Roxas (Liberal Party), Makati Mayor Jejomar Binay (UNO-PMP), former Metropolitan Manila Development Authority chairman Bayani Fernando (Bagumbayan), Sen. Loren Legarda (Nacionalista Party), Edu Manzano (Lakas-Kampi-CMD), broadcaster Jay Sonza (KBL), former Securities and Exchange Commission chief Perfecto Yasay (Bangon Pilipinas) and Dominador Chipeco Jr. (Ang Kapatiran). The COMELEC has also allowed 58 candidates for the position of senator from more than the 100 who filed their candidacy for the position. That list will come out shortly. So – there you go – out of that official list will emerge our nation’s next President and Vice President. 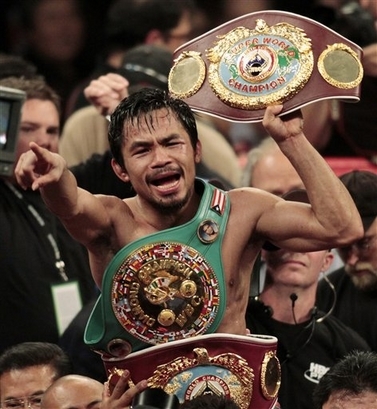 Manny Pacquiao Will KO Floyd Mayweather Jr. 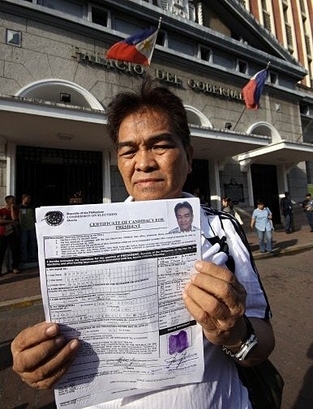 The Philippines is gearing up for its national elections on May 2010 with several notable politicians vying for the Philippine Presidency, and slots in the Philippine Senate, Philippine Congress and other local government posts. Even boxing champ Manny Pacquiao has already field his candidacy to vie for a Congressional seat in his hometown district in Mindanao, and many were expecting that Manny Pacquiao‘s next bout was going to be in the political arena. However, that’s all been sidetracked for the moment as Manny Pacquiao has just signed the fight contract to go up against the undefeated Floyd Mayweather Jr. on March 13, 2010. Manny Pacquiao recently won the WBO Welterweight belt from Miguel Angel Cotto via a 12th round TKO, and made history by being the first and only boxer so far to win 7 titles in 7 weight classes. Indeed, the feats of Manny Pacquiao inside the boxing ring have earned him the reputation of being the best pound-for-pound boxer in the history of the sport. That reputation was also held by Floyd Mayweather Jr., who was also coined as being the best pound-for-pound boxer, and his recent demolition over Juan Manuel Marquez clearly showcases his capacity to be among the top fighters in the sport of boxing. Of course, it wouldn’t take long for boxing fans to want to see a showdown between Manny Pacquiao vs Floyd Mayweather Jr., two of the best pound-for-pound boxers. And after a month or so of taunting and negotiations between the two camps, the deal has finally been sealed. Well, at least in the camp of Manny Pacquiao. Freddie Roach, the trainer of Manny Pacquiao, has already confirmed that Manny Pacquiao has signed the fight contract, and the rest of the world excitingly waits for Floyd Mayweather Jr. to back up all his talk and sign his name on the dotted line. Meanwhile, boxing promoters are already expecting the Pacquiao vs Mayweather fight to be one of the biggest pay-per-view events in the history of boxing, and will certainly put sales through the roof, to earn both fighters a very, very heavy purse. Not only that, many experts anticipate that the Pacquiao vs Mayweather fight will last more than just one bout, and will look to exasperate itself to a three-fight trilogy. However, my opinion is that if Manny Pacquiao wins, he’ll just hang up his gloves, enjoy the fruits of his wins, and concentrate on his campaign for Congress, and if he wins that, then that’s where he’ll be busy for the rest of his life. Well, at least, while he’s still in Congress. Perhaps, this fight against Floyd Mayweather Jr., will be the culminating event to a colorful and illustrious career. Besides, it might be the same if Floy Mayweather Jr. wins. If Floyd Mayweather Jr. defeats Manny Pacquiao, then the whole world can expect a mouthful of arrogance from Floyd Mayweather Jr., and certainly he would love to keep his undefeated record in tact, and will just retire to enjoy his fat paycheck. One thing’s for sure, all of this will be settled in the ring on March 13. My prediction for that fight – Manny Pacquiao will KO Floyd Mayweather Jr., and shut up that loud mouth once and for all.